This is an incredibly easy recipe,which can be whipped up in minutes, baked in 3 minutes, and then filled in no time, for a very impressive dessert. 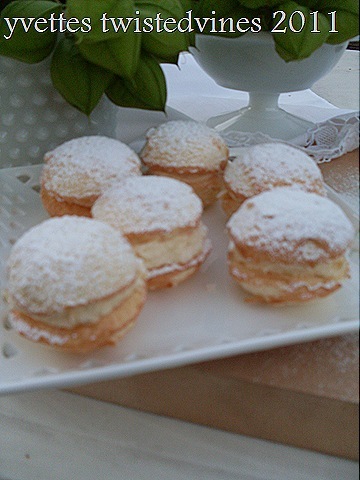 These are called Angel Powder Puffs. They’re so light and fluffy and literally melt in your mouth, even in one bite size. Not hard to make, I whipped them up this afternoon for a afternoon school break up treat. 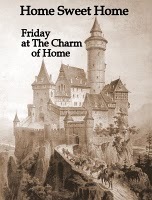 This recipe has been adapted from my local towns ‘Family Favourites’ Kindergarten Apex Cookbook. It was compiled by a couple of trained Home Science Teachers who compiled family proven recipes from the local ladies of the township, hoping to successfully raise funds from the selling of this cookbook to improve facilities at the existing Kindergarten. This cookbook has been on my families cookbook shelf for a while and consists of easy, no fuss and fail proof recipes…and the soiled sheets of this cookbook proves that many a recipe has been tried over and over again. However, a quick phone call to my Mum, to check on the process, didn’t go astray! Separate whites from yolks of eggs. 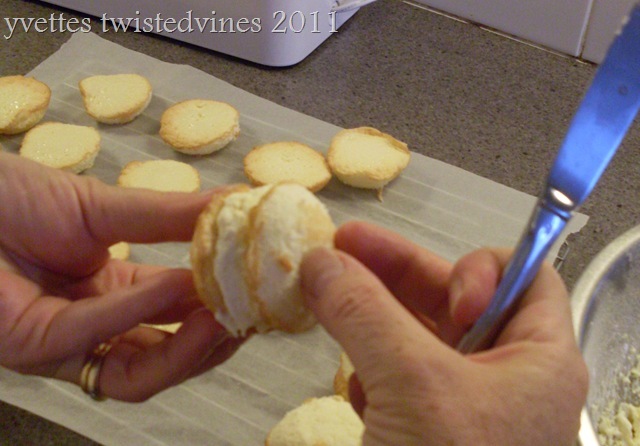 Beat whites with a hand mixer until stiff and forming peaks. Gradually add sugar. Gently add yolks and beat until smooth and creamy. Sift cornflour, self raising flour and cream of tartar twice into a separate bowl. 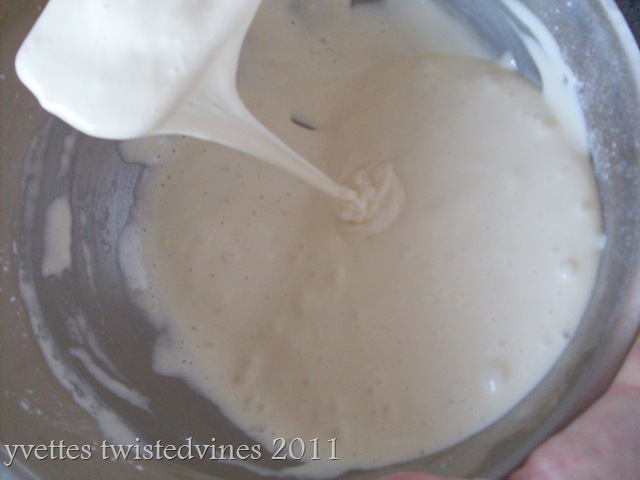 Gently fold into egg mixture. 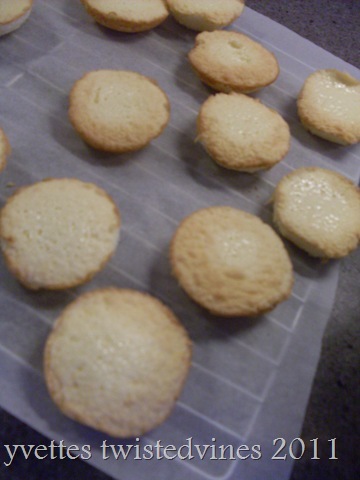 Bake in a fairly hot oven (190°C) for 2 – 3 minutes. Until just golden. Turn out from patty pan tray and leave to cool, these don’t take long to cool at all. 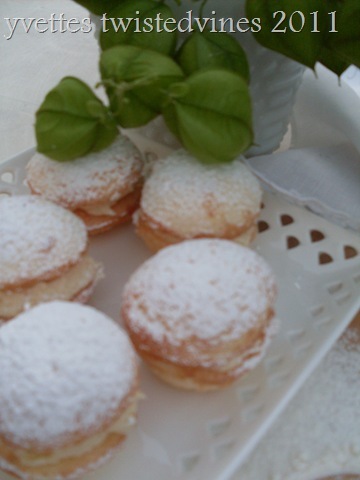 Make sure you make an even number of powder puffs, otherwise there will be too many samples! 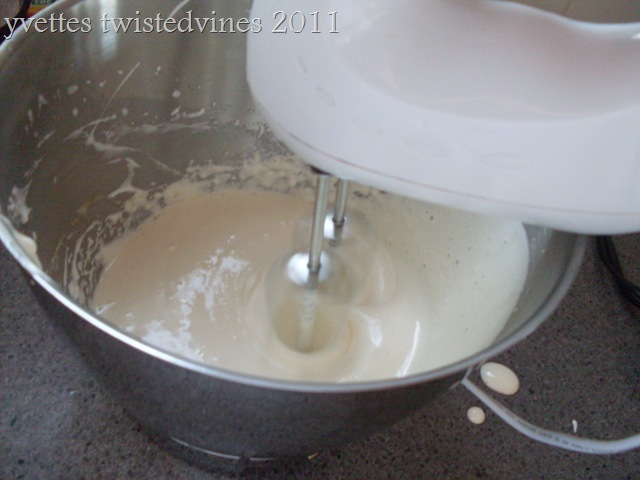 Beat all ingredients for 2 minutes with electric hand mixer until creamy. 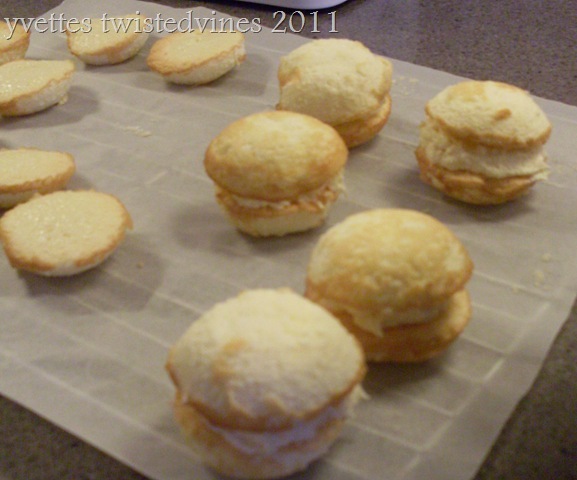 Sandwich together two halves with mock cream filling. 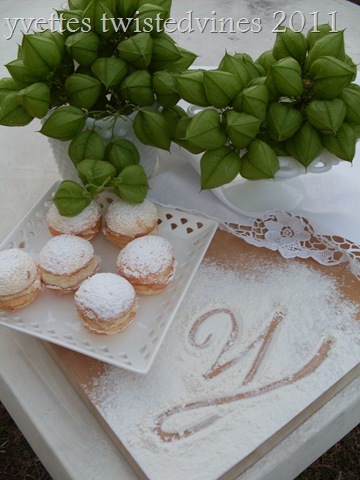 Dust each angel powder puff with icing sugar. 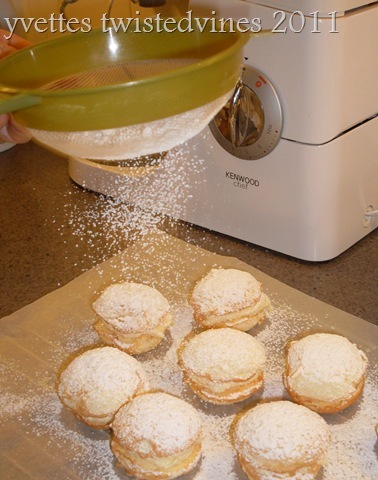 So all done with a matter of 30 minutes…this was a trial run for tomorrows night guests…on tomorrows night menu, angel powder puffs filled with strawberries and others with a passion fruit filling…I’ll tell you how they go! OMG! These look and sound A-M-A-Z-I-N-G !!! They look pure heaven, Yvette! Absolutely magnificent – what wonderful treats and I love your first picture. Thanks!! I will definitely be making these adorable cookies!! 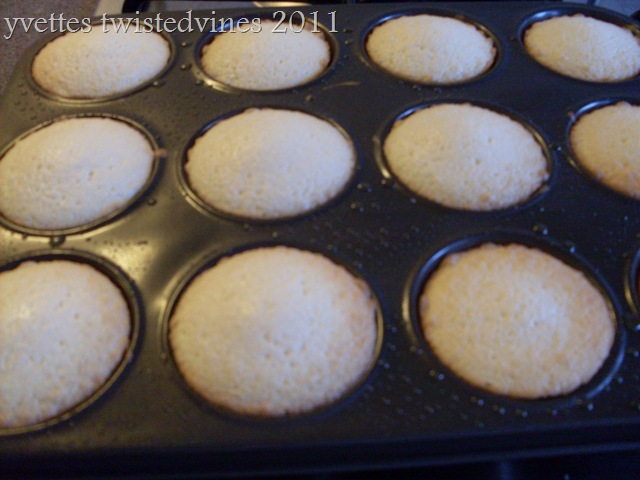 Oh they look so light, fluffy, and delicious! I’ll have to make them sometime with my daughter. She would love it! Thanks for sharing! Thank you so much for your comment and I am looking forward to reading all of your charming Easter crafts! Thanks for stopping by my blog to say “hi”. I answered your question about the beef sandwiches, too. I want to reach right in and grab one of these sweet treats. Looks yummy! 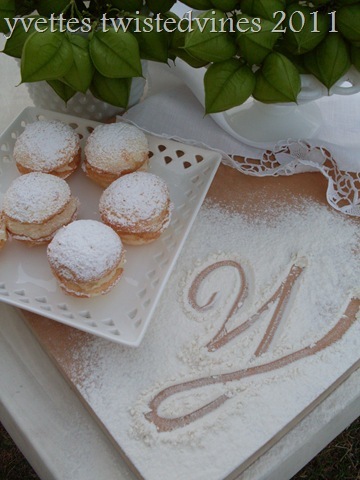 Yvette – these look devine. I think I’ll have to make them for Easter brunch. Thanks for the inspiration.